Couple of new toys I brought recently, I've had a normal DMM Pinto since they came out, but have wanted the rig version for a while now. 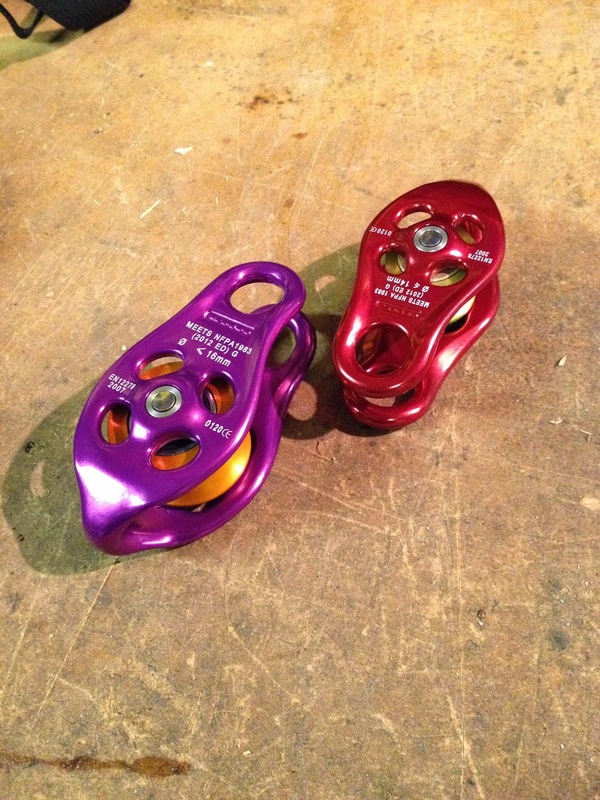 I've used the pinto for redirects, both of the climbing and lowering line, mini haul systems and occasionally speed lines. Having a few at my disposal will just give me a few more options. 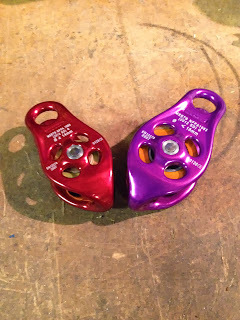 I know you shouldn't use personal climbing equipment for lowering and vice versa, but I have done previously in the past. 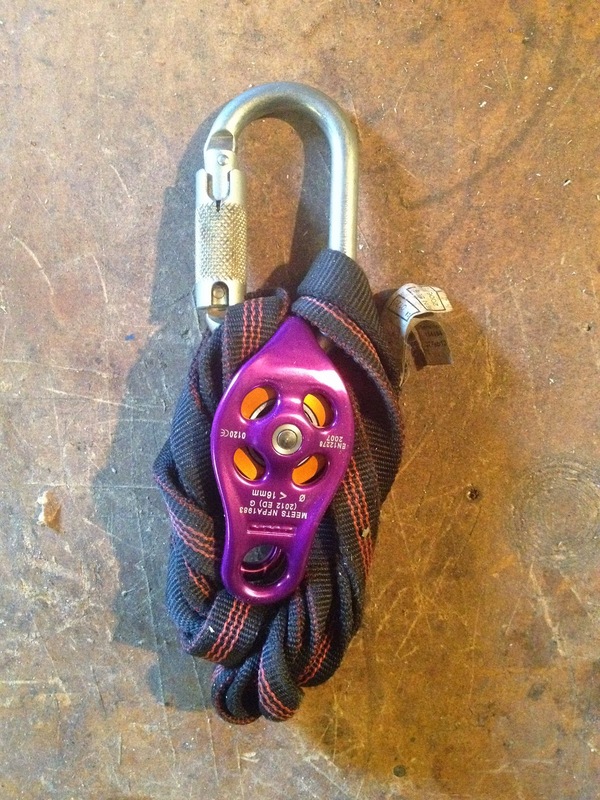 But now I can use the rig, exclusively for rigging and the normal pintos just for climbing. 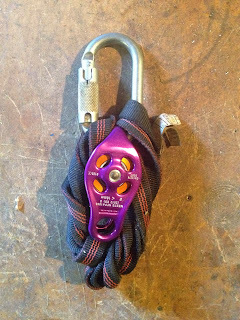 As a quick redirect or for small scale lowering, the rig will live on a DMM steel oval with a short lyon sling, set up like this it takes up little room on a harness and can be carried on the off chance you may need it, rather than having to wait for the groundy to dig it out of a bag and send it up. I used to do this with the normal sized pinto, which was fine but not ideal for a 16mm lowering rope. 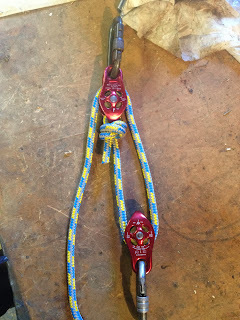 I was also toying with the idea of having a mini 2:1 haul system on 10mm line set up for pretensioning the lowing line and think that they would work well for that, especially as the beckets are rated. Just with 10m of rope or so in a mini stuff stack. Although this would obviously mean I could only then use them for rigging. Something like this, but ideally I'd want to be able to quickly attach/detach it to the lowering line, anyone know of a 16mm mechanical ascender that would do the job?